Enjoying a mainly south facing garden, this detached family home offers well planned accommodation on this exciting new village development. Reflecting the overall feel of the site, it is stone built and has attractive stone detailing around the windows. A spacious hall has built in storage and the staircase with a half landing to the first floor. The remainder of the ground floor comprises a well fitted and equipped kitchen/dining/family room, utility room, lounge with open fireplace and log burner, study, cloaks/wc. Upstairs the master bedroom has en-suite shower room and built in wardrobe, with two further double bedrooms. The family bathroom has bath and separate shower. A detached single garage is located to the side of the house with extra parking on the driveway. 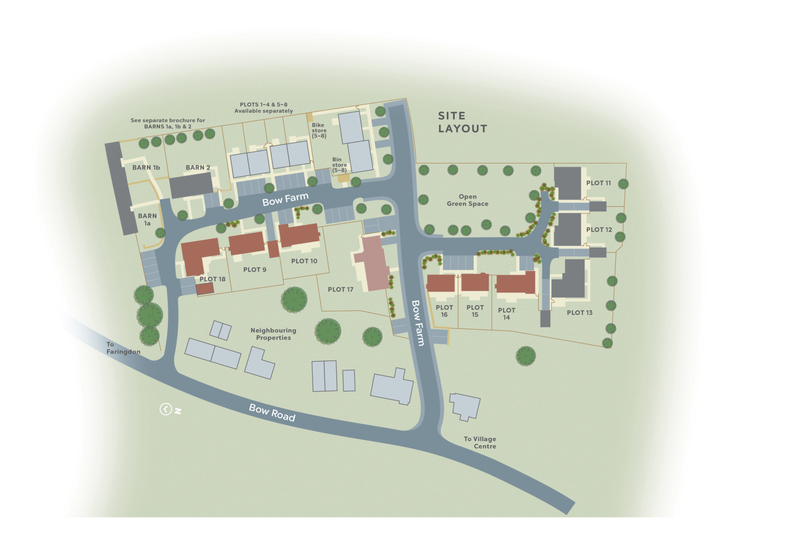 To register your interest in The Shellingford, Plot 9 and/or to arrange a viewing, click the button below and fill out the form. 3840mm x 3815mm 12'7" x 12'6"
6015mm x 4020mm 19'9" x 13'2"
3190mm x 2040mm 10'6" x 6'8"
2515mm x 1540mm 8'3" x 5'1"
4660mm x 3980mm 15'3" x 13'1"
3885mm x 3155mm 12'9" x 10'4"
3885mm x 2760mm 12'9" x 9'1"
3460mm x 1255mm 11'4" x 4'1"
3140mm x 2570mm 10'4" x 8'5"
The Shellingford, Plot 9 is part of the Bow Farm development. For more information click the button below.